The first uniform worn by boys of De La Salle Lipa wore brown khaki pants. This, I suppose, is the natural follow-up to my previous article about the DLSL coeds’ uniforms; and how it changed to what it is now. If you are an alumnus or student and you are thinking that there isn’t an awful lot to say about the boys’ uniform because it hasn’t changed over the years, well, you’re wrong. 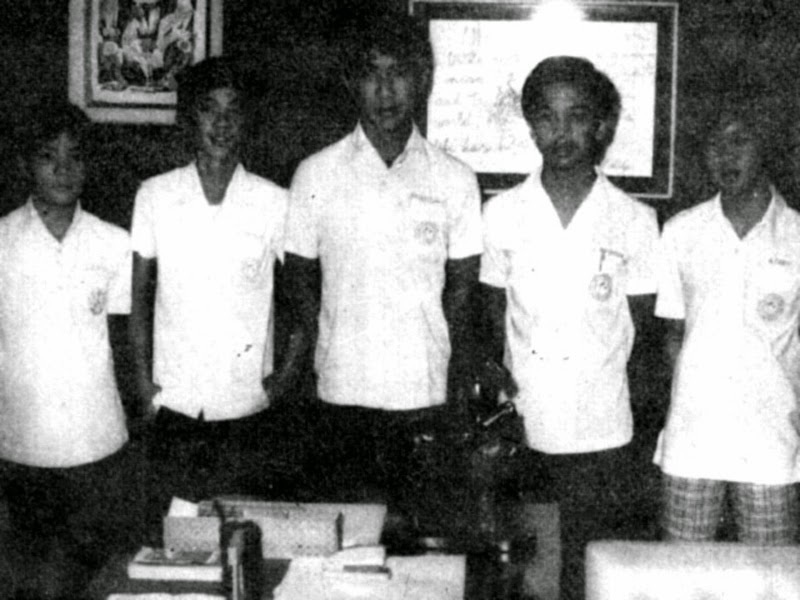 When the Brothers’ first opened a high school in Lipa in 1962, the uniform was white polo shirt and brown khaki pants. This was still the uniform when I transferred to La Salle as a Grade 5 student from the Our Lady of the Rosary Academy in mid-1969. As was the convention of the day, both the shirt and the pants were starched before they were ironed. I had always hated putting on starched clothes because they were not only stiff; they were also itchy. The school seal was round and sewn over the breast pocket. In the middle of the seal was a coconut tree, something that may seem odd these days. However, the school was built over what used to be a coconut grove; and many of the trees remained till the nineties. The black pants first made an appearance in 1970. I’m not sure, however, if it was required. I just checked the yearbook of 1971; and while majority wore what looked like black pants – the pictures were naturally black and white – there were those wearing pants of a lighter shade. What I do recall is that I wore black pants when I was a freshman in school year 1971-72. By this time, the coat of arms had also changed into something more recognisable to younger alumni: the one with the horses on either side of the main face. The new coat of arms was introduced during the term of Br. Rafael Donato as Principal in the late sixties. It was designed by one of the brothers in the community; but I regret to say that I cannot recall his name. By the time that I was a sophomore in school year 1972-73, black pants were no longer required. The white polo shirts with the school seal continued to be obligatory; but we could pair these with any dark-coloured pants. By the mid-seventies, the pants were not really part of the uniform. Of course, dark was a matter of opinion. I remember that I used to wear this bright red pair of pants to school; and that was perfectly fine. I had pants of other colours which were perfectly acceptable during the era. As was the fashion of the era, these pants were ridiculously flared, the term generally accepted to mean bell-bottomed pants. The lower ends of the pants could be anything from 22 to 24 inches. We practically swept the floors with them. Moreover, the school wasn’t particular about the shoes that we wore. Sneakers – we called them rubber shoes, probably because of the rubber soles – were alright even in the classroom. I think it was also when I was in high school when name plates were first required to be sewn above the breast pocket. I don’t, however, remember the exact year when this was made obligatory. The uniform – or if you wish, the lack of it – continued until the latter part of the seventies. Of course, by this time, I was in college. I did not return back to DLSL – this time, to teach – until the start of school year 1982-83. By this time, black pants and black leather shoes had become obligatory in the classroom; and this has been how it has been to the present day. In a way, the pants’ design got stuck in the eighties when straight cut pants were in fashion. The only other thing that really changed has been the seal, which was redesigned during the Presidency of Br. Manuel Pajarillo. It was part of the overall rebranding of the school that we at the External Services office were undertaking. We wanted to retain all of the elements of the previous seal; but we also wanted to make the new one so much more computer-friendly. The old one just never looked good when reduced to the size of a thumbnail. By the way, the current seal was designed by Lorna Achico, then our Publications Officer.